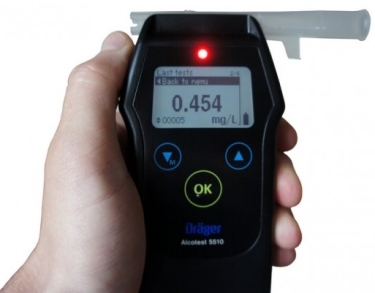 The Drager Alcotest 5510 is the entry level model of the successful Drager Alcotest range. User friendly and compact, the Drager Alcotest 5510 gives the user precise and quick breath alcohol analysis. The Drager Alcotest 5510 can meet many different international regulations and guidelines due to its wide range of possible configurations. Safe and easy to use - Automatic sampling and calibration processes make the instrument easy to use. All measurement functions are controlled via a single key, while menu navigation is by two menu keys. The special way the mouthpieces are designed means they can be fitted quickly and securely even in poor light conditions. Rapid ready for use - The very latest in electronics technology en sures that the instrument is ready for use in no time at all. Quick and precise analysis - The 1/4"-DragerSensor with its optimized gas dynamics measures specifically alcohol. Even at high alcohol concentrations direct gaspaths, fast pneumatic components and short reaction times of the sensor ensure the measurement result will be displayed quickly. Low energy consumption - More than 1500 breath alcohol tests can be conducted on just two mignon batteries (AA size). "Slide'n'click" mouthpiece - The shape of the mouthpiece means you will intuitively fit it correctly. An air outlet which cannot be obstructed prevents any manipulation when the breath sample is given. A spacer on the mouthpiece prevents the test subject's lips from coming into contact with the instrument's housing, and at the same time may be used as a mouthpiece ejector. The individually packaged mouthpieces can be attached to the instrument easily and hygienically. Practical design - Thanks to its compact dimensions, the Drager Alcotest 5510 even fits into a shirt pocket. The ergonomic design makes the instrument equally easy to use for right and left-handed people. The separation of the grip area and the mouthpiece automatically ensures a certain distance between the hand of the operator and the mouth of the person to be tested. Integrated datalogger - The latest 10 measurement results with their respective test numbers are stored in the datalogger. Individual results can be called up from the log by pressing the menu keys.